Calvin Harris : I Created Disco (Glow in the Dark Cover) CD (2007) . Condition is Like New. Dispatched with Royal Mail 2nd Class Large Letter. Artist: CALVIN HARRIS. Title: I CREATED DISCO. Label: COLUMBIA. Year: 2007. Title: ALBUM SAMPLER. Artist: CALVIN HARRIS. Label: COLUMBIA. Format: CD. Artist: CALVIN HARRIS. Title: I CREATED DISCO. FAINT STICKER REMOVAL MARK TO REAR OF SLEEVE (DISCOOO8). Label: COLUMBIA. Condition (Sleeve/Disc): EX-/EX. Artist: CALVIN HARRIS. Title: I CREATED DISCO. Label: COLUMBIA. Condition (Sleeve/Disc): EX-/EX. Artist: CALVIN HARRIS. Label: COLUMBIA. Format: CD. "Acceptable In The 80s". 1 Acceptable In The 80s (Radio Edit) 3:31. 3 Acceptable In The 80s 5:33. 4 Acceptable In The 80s (Tom Neville Remix) 7:16. 2 CD singles on Fly Eye label. "The Girls". 1 The Girls (Radio Edit) 3:52. CALVIN HARRIS - I CREATED DISCO(CD Album). I Created Disco. Disco Heat. In superb condition with fold-out picture insert in a jewel case. Neon Rocks. This Is The Industry. The Girls – radio Edit. The Girls – Groove Armada Remix. The Girls – Mixckey slim’s Bomb Squad Mix. CD Like New. I Created Disco - Calvin Harris (4.08). Disco Heat - Calvin Harris (4.31). Neon Rocks - Calvin Harris (3.48). Colours - Calvin Harris (4.02). This Is the Industry - Calvin Harris (3.56). The Girls - Calvin Harris (5.15). Genre: house, electro, synth pop, disco. Title: CALVIN HARRIS i created disco. 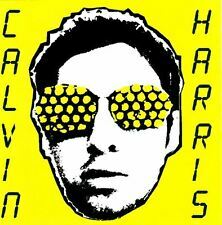 Calvin Harris ‎– I Created Disco. House, Electro, Synth-pop, Disco. I Created Disco 4:07. Disco Heat 4:30. Neon Rocks 3:48. Electronic, Pop. Vegas 5:41. Acceptable In The 80s 5:32. Up for grabs, Calvin Harris Acceptable In The 80’s Australian CD Single. Acceptable In The 80’s - Radio Edit. Acceptable In The 80’s. Acceptable In The 80’s – Tom Neville Remix. CD Like New. 3 The Girls (Groove Armada Remix) 8:04. 1 The Girls (Radio Edit) 3:52. PROMO - Double cardboard sleeve with die-cut sunglasses effect. The Girls (Album Version). 2007 UK CD from Fly Eye, Columbia. The Girls (Groove Armada Version). The Girls (Micky Slim's Bomb Squad Mix). 05 Acceptable in the 80s. 09 I Created Disco. 10 Disco Heat. 06 Neon Rocks. 04 The Girls. 03 This Is the Industry. 11 Vault Character. 4 Acceptable In The 80s (Tom Neville Remix) 7:16. 1 Acceptable In The 80s (Radio Edit) 3:31. 3 Acceptable In The 80s 5:33. CALVIN HARRIS. I CREATED DISCO. I Created Disco. Disco Heat. Neon Rocks. Vault Character. This Is The Industry. 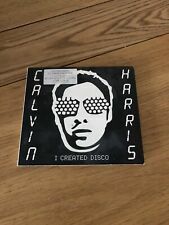 Calvin Harris : I Created Disco CD (2007) NEW Title: I Created Disco Artist: Calvin Harris Genre: Dance|Electro Duration: 55.30 mins Format: CD / Album Type: CD No. of Discs: 1 disc(s) Studio / Label: Columbia UK Release Date: 22 Oct 2007. I Created Disco. Disco Heat. Neon Rocks. Love Souvenir. Vault Character. Artist: Calvin Harris. Title: I Created Disco. I Created Disco. Disco Heat. Neon Rocks. Format: CD. Condition (Sleeve/Disc): New. Vault Character.